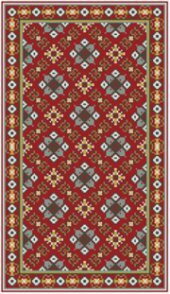 This is a beautiful rug in wonderful rich colors, so beautiful, in fact, that Bobbie also made a companion runner of it and a smaller version of the original rug. The colours are three shades of blue, green and gold on a deep garnet background. 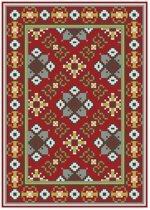 This is the same beautiful pattern as the rug above. The only thing different is the size. This, too, is the same pattern as the large rug at the top of this page, only in a smaller size. The dimensions given is when worked on 40 count. companion to the Summer Stripe Pillow. Its large flowers, vines and leaves are shades of shell pink, antique violet, antique blue and pistachio green. The background shown is off-white but black, which you may request, would also be stunning ...please note this in the Comments section of the order. 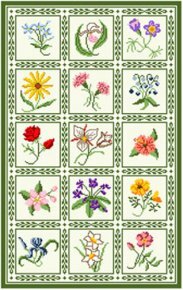 This is perfect for most any room in the house, sun porch or conservatory. The colours are pinks, blues, reds, corals, whites, violets, yellows, greens and more. Just like bringing your garden inside -- a real beauty! If you prefer a different colour background, please note this in the Comments section of the order.